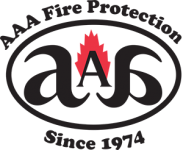 AAA Fire Protection Services has been in business since 1974 providing Stockton and the inland area of the San Francisco Bay Area with fire protection services for its businesses. We are an authorized Ansul fire systems installer and we help local businesses maintain compliance with our emergency light installation program. Our team of professionals spans many Bay Area and Central Valley industries. Our expertise in fire protection allows us to help your business stay in compliance. For industries with specific compliance issues, we have solutions. For example, within the automotive industry, paint booth fire systems are required when those businesses work with chemicals associated with painting. In addition, we provide emergency light service and periodically we provide emergency light testing and emergency light repair so that your business is always protected. With over 40 years of fire protection experience, AAA Fire Protection Services understands exactly what we need to do to reduce your risk of fire and to help you recover if there is a fire.